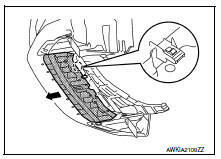 Remove front side of front fender protector (LH/RH). 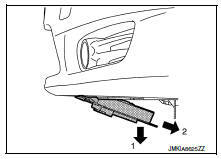 Refer to EXT-28, "FENDER PROTECTOR : Removal and Installation - Front Fender Protector". Remove engine under cover. EXT-31, "ENGINE UNDER COVER : Removal and Installation"
Remove front under cover bolts and clips. Slide front under cover toward vehicle front to release pawl. Pull toward the direction of the arrows as shown to remove front under cover. 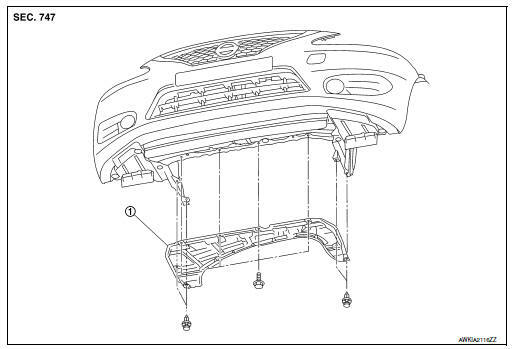 Remove engine under cover bolts, clips and engine under cover.